Sunset Cliffs. Photo by Jim Grant. In San Diego’s surfing turf wars, tempers heat up as the waves become more crowded. Are the skirmishes a solution or a symptom? I’m not violent, but I have had some times where we’ve had to do some breath-holding exercises, me and another guy,” deadpans Nate Cintas. “That’s just part of it.” Part of waterboarding? No. Part of surfing? Yes—if you surf at Cintas’ spot at Sunset Cliffs and don’t obey the locals’ rules. Cintas, known to many as Irate Nate, has for years been one of the heaviest enforcers at his home break—a wave surf magazines won’t run photos of, much less mention—solid, powerful, with close-cropped hair and in great shape for a man in his 40s. Born and raised less than a mile from the Cliffs, he’s a local in every sense of the word. When Cintas talks about breath-holding exercises with other surfers, you get the feeling he’s not the one holding his breath. It doesn’t stop with being held underwater. How does surfing—which, to an outsider, means simply riding waves toward shore, then repeating—reconcile throwing rocks at “kooks” before they enter the water, cutting them off, breaking fins, harassing, drawing blood or vandalizing property? For years, locals have fiercely protected what’s theirs—or what they perceive as theirs—from Sunset Cliffs to the South Mission Beach jetty to La Jolla’s many reefs. Some contend this at-times-brutal defense maintains safety in the water and preserves the integrity of surfing against those who endanger others or don’t abide by the implicit rules. “or what they perceive as theirs” is the correct phrase! I lived and surfed in OB for almost 20 years before being drafted in 1971 such behavior would have gotten you a broken beak! Cintas neither owns nor created the cliffs, the waves, the beaches and has no more right than the next person to say who surfs where! The “rules” of the wave should be all that ever applies to a sport that founded itself in the search for freedom and oneness with nature! I put a dollor on nates car. it made my day. I just wonder if irate nate actually has fun surfing or is he to busy playing surfing hitler. I also wonder if he has any real friends. I also wonder has he inculcated his real love of the water , surfing and the beauty we ALL have to enjoy to his family. I hear his son is a surfer hopefully he DOES not share his fathers chip on the shoulder. Mr. Irate Nate needs to learn from people who REALLY have the Aloha Spirit. He is a fake. I feel sorry for him. The article is a real shame I know not all sufers at the cliffs agree with him. The other two interviewed in the article made mr. cinitas look like a real fool. I guess hes a big tough guy, well even big tough guys get beat down …just ask the bird rock bandits after they get out of jail. It is a shame he made The Cliffs and OB look like a stomping grounds for pissed off surfers. All surfers are equal, but many of the surfers that ride stand-up see themselves as more equal than others. I don’t thiny irate nate is a stand up surfer. Not sure what to call Cintas but Skip Frye is truly a gentleman …I bet all those dudes in the surf which have no respect for the rules of the waves have no respect for the rules of the road. If only people had more respect for themselves, the world would be a more peaceful place. Thanks, Jon glad you got it !! Whoever Debbie is she makes a good point…either you respect people or you don’t I get the feeling and my old age would tell me mr cintias is a big bully. He must have been picked on as a kid or dropped on his head as a baby. Maybe he ate paste or lead …I know one thing he DOES not reflect the attitude of the surf culture. Apparently some locals put up a sign outlining the local surfing “rules” at Sunset Cliffs just like Nat Young suggested in this story. I think it’s a great idea, but the only problem is, they did it with such contempt and arrogance, that it created a backlash. Their intention was intimidate rather than educate. These guys should all take a lesson from a class act like Skip Frye. I sent a comment but it isn’t here. Because it was too radeical? Only a time or 2 did I encounter a gentleman or lady in the surf. 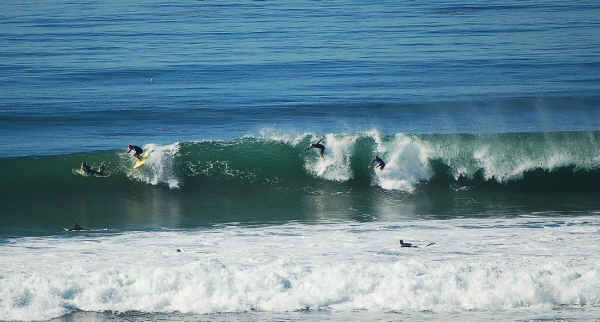 Here or at Windansea, Big Rock, SoCal, Malibu, Baja. But I often would at Makaha, Pipeline, Puerto Escondido, Peru & Ulu Watu. So you can all just swhut up. Hi Joe, I looked for your comment (sometimes they end up in the spam) but didn’t find it. Must have been a glitch, sorry. Seen it good seen it bad,THE cliffs remain the same, the gyro-heads will never understand, never worth fighting for; most “surfers” are just “ROLL-OVERS”; NEVER CAN STAND AND MAKE AN INTELLIGENT COMMENT ON SOME THING SO PURE. Good luck to all you wanna be “LOCALS”, GO GET SOME BOYS? Older Article: Has Obama Lost the Left? Why Is He Still Pushing Bi-Partisanship?